SAFETY - The job of hanging fire hose to dry and drain usually occurs at a time when firefighters are already fatigued and subject to injury. With our tower, all work is done at ground level (no men aloft), which not only eliminates a source of possible costly industrial injury, but eliminates an area that could receive the blame for an injury. EFFICIENCY - With minimum manpower today, productivity is a must - and with the TIGER TOWER one man can accomplish much more in far less time than two or three with any other known hose drying procedure. 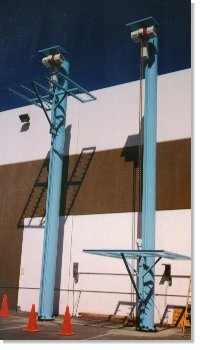 EFFECTIVE - With this tower the hose is not only dried well, but is throughly drained which is necessary for an even hose bed load on the apparatus. 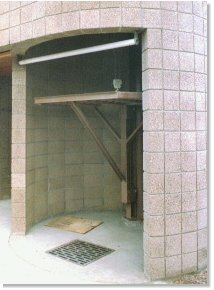 CONSERVATION - The area required for this tower is less than the parking space for a compact car, and uses much less energy than drying cabinets. APPEARANCE - The TIGER TOWER is free standing. No external braces or guy lines, clean and neat. We will paint it the color of your choice to blend with your station. This tower cannot be compared with the old type in appearance. 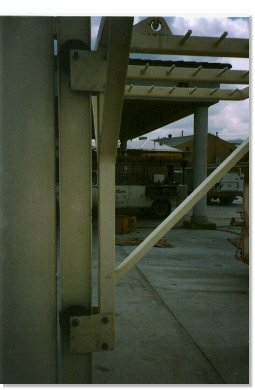 OTHER FEATURES - The tower can easily be relocated, if the need should arise, by removing the six anchor bolt nuts at the base and lifting it off the foundation and placing it on a new one. Some Fire Chiefs have suggested using the tower for drying salvage covers, hose bed covers, etc., and also using it for small ladder drills. The top of the tower can also be used for flood lights and radio antennae. All towers are patented and are unconditionally guaranteed for one full year.